I lived in Hawaii for ten years. It is stunningly beautiful. That’s all. 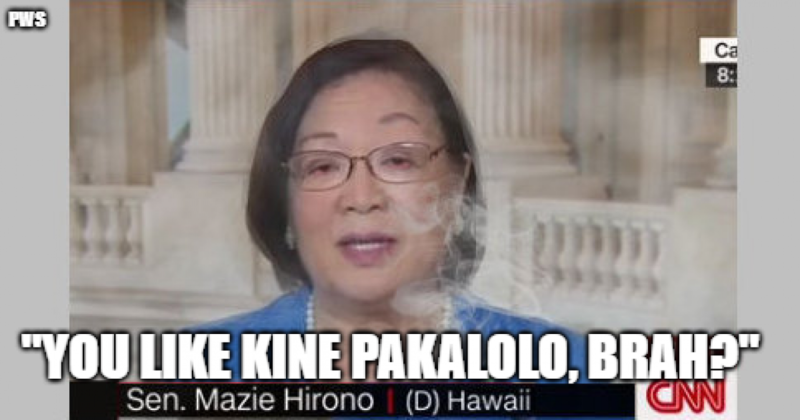 It is too expensive for the average person to live there, there is a decided prejudice against outsiders, especially on the outer islands, it is a hopeless welfare state, taxes are astronomical, there is only one political party, Democrat (the Hawaii Republican Convention could be held at an L&L diner), and they send certified morons like Mazie Hirono to Washington. Mazie snatched the title of Dumbest Woman in Washington from Nancy Pelosi some years ago, and what an entertaining match it was. The game-winning play was Mazie having to be told by an ICE official that is actually illegal to enter the United States without permission. She had no idea! “I’m confused” was all she could say. No, Mazie, you aren’t confused. You are STUPID! Now a pretender to the throne, Alexandria Ocasio-Cortez, has stepped forward and is offering gaffe after hilarious gaffe in an involuntary effort to unseat the witless wonder from the Aloha State. Not so fast, newcomer! Mazie will not go down easily, although many in Washington claim to have evidence to the contrary. You are as smart as Crazy Mazie. That isn't a compliment. There is nothing out of context regarding what the dumbass said. She said, "We Democrats know so much. That is true. Now, we kinda' have to tell everybody how smart we are." That is a quote. Nothing out of context! Crazy Mazie’s “I’m confused” moment, discovering for the first time that entering the United States illegally is a crime. ICE official has to explain to Democrat Senator Mazie Hirono that entering the country illegally is a crime. “Why are all of the contenders to the title of Dumbest Woman in Washington Democrats,” you ask. Because it takes morons to elect morons and blue states are filled with them. That’s why.